Thames Discovery Programme - Join the TaDPoles! 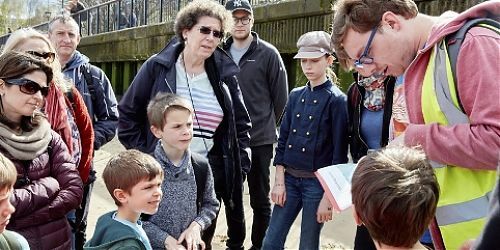 The Thames Discovery Programme is looking for budding young archaeologists to join our TaDPoles foreshore archaeology group. Working at your own site on the Thames foreshore you will have a chance to learn and practice archaeological techniques. 20th January: A chance to explore the archaeology of the Thames and to start the TaDPole journey. This indoor session will consist of examining the different finds that we can come across but also the different periods they belong to, and what this can tell us. We will also look at how London has changed around the river and what the archaeology can tell us about these changes. 14th February: In preparation for fieldwork, this session is all about different ways to record. The TaDPoles will learn how to record on paper and by photograph features on the foreshore. These skills will be ones that the Tadpoles will use as they go out onto the foreshore. 3rd-4th April: Our first time on our own site at Custom House will be split into two days. The first day will include a site tour and walkover talking about the key features of the site, and beginning to think about what the group want to find out more about over the coming months. Day Two will be the first official day of fieldwork with the TaDPoles beginning recording work on site with a trained archaeologist and will enable them to start ticking off their key skills. 31st May-2nd June: Our next fieldwork period back at Custom House, continuing our work on the foreshore there. It will be a chance to continue to develop the key skills that have been taught. There will also be a visit to the FROG on the site at Cannon Street on one day. Further information: Meet at Custom House Stairs, Water Lane EC3R 31st at 9.30am, 1st at 10.00am and 2nd at 10:30am.